Experience true beauty on a trip to Japan, the “Land of the Rising Sun”. Experience our Tokyo tours, Japan’s capital, to explore ancient architecture and modern landmarks. Visit the famous Mount Fuji in all its glory, discover the region of Shirakawago, a UNESCO World Heritage Site, and tour the historic Imperial Palace district. Call smarTours today to book your next vacation! It is 2 weeks ago that we returned from our "Discover Japan" tour. What a great enjoyment it was, and how lucky we were! We managed to experience the cherry blossoms (Sakurai) in all the towns on the agenda.Even our guide, graceful Yoshimi Ozawa, was amazed about our great luck and exclaimed that two weeks before there was nothing to see. To add to our enjoyment, we were able to see Mount Fuji's upper cone above the clouds.Yoshi (as she wanted to be called by us) was extremely well organized and very eager to share her extensive knowledge of Japans history, customs and living conditions with us. We were duly impressed by the cleanliness of the cities, streets and people. Especially the rail road stations in Tokyo, Kanazawa and Kyoto are far and above in architecture and organization over any that we seen in Europe (let alone here in the US). The visit to the Mitsukushi department store was eye opening. The quality and quantity of the products on offer exceeded anything here in the US. Even more so were the the great number of sales clerks available to help, but not at all "pushy".The hotels were very good and the breakfasts quite sufficient. The included meals were also good. Our concerns of having to spend extensively for meals were unfounded since there were a great variety of lower costs options.Just the long and congested breakfast lines at the New Otani Hotel dimmed the outlook for the day. Having to wait up to 40 minutes, even though there were empty tables, should not be an acceptable condition.Transportation in general , be it by bus or train, was very good. However, We did not understand why the suitcases were moved from Takayama directly to Kyoto, depriving us of them in Kanazawa.We came away from this journey admiring the Japanese people that went through such dramatic changes since the middle of the last century. Great time in Italy with Massimo as the tour guide. This was the trip of a lifetime as we saw countless historic and amazing things in Italy. Venice was wonderful with the water traffic and Murano glass factory. Florence had so many artistic scenes and a beautiful background. Rome was spectacular with the Collesseo, Vatican, Forum, and National Monument. The food was incredible, we are not fans of wine but it was excellent. We took advice from Massimo and went to several walking areas on our own - Florence Palace Pitta, and the famous Bascillica; Rome downtown National Monument. We just got home from this trip and had a great time! The trip was well organized, meals were delicious, and the only hotel we weren't too happy with was the Randle in Killarney. The tour director, Peter Murphy, was very knowledgeable and he and the 9 other people (there were only 11 of us) on the bus were super nice and so much fun to spend time with. They made our first trip to Europe a very memorable one. We would recommend this company to anyone thinking of going to Ireland. We were on the middle October 2017 tour. Our tour guide, Oli, MADE us stay out on the tour the first night that we were there--for some of us having stayed up for nearly 24 hours BUT--he was right we had views of the Northern Lights that never appeared another night--He was great--I loved all the tales of the Trolls and Hidden People--he was very informed about all the things that make Iceland so special. Plan to go back. The worst part of the whole trip was my getting called out--cataracts and all--for extra scrutiny at the Reyjavik airport--and that the overnight at JFK was unbearable--except for watching some Peruvians in native costume--recognized from our trip to Macchu Picchu --who were waiting on a flight.--Hated that part of it all--the connection--but loved the trip itself. Your fascinating sojourn to mysterious Japan begins as you depart today on your overnight flight. Day 2: Arrive Tokyo (Japan). Welcome to Japan, the “Land of the Rising Sun“. Evening arrival in Tokyo, Japan’s vibrant capital. Tokyo is a great mix of ancient Japanese culture and modern, dazzling architectural landmarks which you’ll be able to explore over the next few days. Your tour host warmly welcomes you upon arrival and escorts you to your conveniently located hotel. Your host will share with you some vital information about Japan, Tokyo and your upcoming tour program. Morning guided tour to explore some of the highlights of amazing Tokyo. Start with a visit to the 1093 ft tall Tokyo Tower. From here you may enjoy bird’s eye views of the sprawling metropolis. Then, tour the historic Imperial Palace district dating back to the 15th century. The emperor and his family still live in the western part of the Imperial Palace. You’ll see the charming East Outer Garden with views of the ancient castle walls and ruins. Your tour continues with a visit to Asakusa Kannon, Tokyo’s most spectacular and sacred Buddhist temple. Narrow alleys filled with small shops, restaurants and tranquil gardens surround the temple. Stroll along Nakamise Street nearby, filled with stores stocking treasure troves of traditional Japanese wares and crafts. You’ll also visit the nearby exciting Ginza district renowned for its superior shopping, dining and entertainment. The balance of the day is free for independent pursuits. Day 4: Mt. Fuji & Hakone Excursion. Japan’s pastoral countryside unfolds as you depart Tokyo today for Mt. Fuji and Hakone. The main attraction here is majestic Mt. 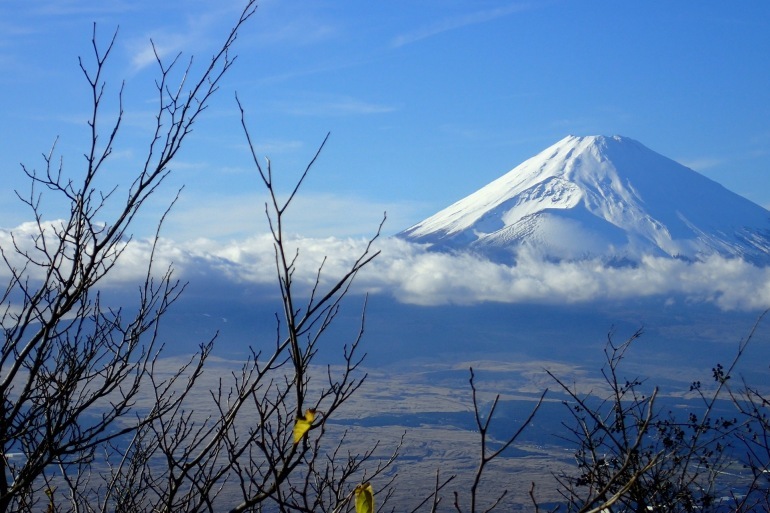 Fuji, a dormant volcano that last erupted almost 300 years ago. The mountain’s perfectly shaped cone has inspired artists and poets for centuries. Weather permitting, drive up to the fifth station of the snow capped peak for panoramic vistas. Embarking on a scenic boat ride on tranquil Lake Ashi. Later, enjoy a gondola ride on the Komagatake Ropeway for a sweeping view of Hakone and Mt. Fuji before returning to Tokyo late this afternoon. Spend a day at leisure to explore Tokyo from your conveniently located hotel. For a real taste of Japan, get up early and head for the colorful wholesale fish market! You may also join an optional excursion outside Tokyo to Nikko. Nikko is a magnificent complex of shrines dedicated to the first shogun, adorned with some of the finest woodcarvings in all of Japan. After breakfast, join your guide for a stroll through the fascinating Jinya-mae Morning Market along the Miyagawa River in the old town. This 200-year old colorful market bustles with farmers selling fresh fruits, vegetables, flowers and traditional local crafts. Proceed to the Takayama Jinya, a complex of 17th century buildings that once housed officials of the Tokugawa Shogunate. Today, it is a museum with historical displays from the time of direct rule to the Meiji Era. The balance of the day is at leisure to explore the quaint old town on your own, delight in the unique atmosphere Takayama is renowned for and possibly relax in a soothing traditional hot spring bath! Today enjoy a visit to the historic Oumicho Market, a busy and colorful market and explore along with local residents some of the 200 shops selling seafood, vegetables, fruits, flowers, regional specialties and more. Later you’ll be whisked back in time to the exciting Edo period when you visit the Nagamachi district, a small neighborhood of narrow, cobblestone streets where brave samurai warriors once lived. Many homes are still occupied by the samurai descendants but you’ll visit the Nomura Family house that is open to the public where you can admire the stone lanterns and bridges in the garden as well as the cypress-wood ceiling in the residence. Proceed to the beautiful Kenrokuen Garden, one of the finest gardens in Japan and marvel at the waterfalls, ponds and charming tea-houses. Later, stroll through the charming Higashi Geisha district before transferring to the station for your train ride to splendid Kyoto. Embodying Japan’s rich culture and complex history, Kyoto has over 2000 temples and shrines, delightful gardens and exceptionally preserved wooden buildings. The sights, wonderful local cuisine and exceptional arts and crafts are certain to enchant you! Upon arrival in Kyoto, transfer to your centrally located hotel. The capital of Japan from 794 to 1868, Kyoto is a world-class gem, a true oasis. Today, depart on a guided tour exploring some of the city’s highlights. Begin at Nijo Castle, renowned for its ornate interiors. Built by Shogun Tokugawa Ieyasu in the early 17th century, the castle symbolizes the power and riches of the newly established Edo-based Shogun. Your next stop is one of Kyoto’s most inspiring sights, the Temple of the Golden Pavilion, also known as Kinkaku-ji. As you approach the temple via a tree-shaded path, emerge into an exquisite Japanese-style garden on the other side of which stands the fabled pavilion. It is built on pillars magnificently suspended over a lake. Proceed to the colorful Handicraft Center where you can see demonstrations of traditional Japanese arts and crafts. This afternoon visit renowned Kiyomizu Temple, founded in the 8th century. Situated halfway up the Otowayama Hill it encompasses a vast area and affords stunning views of Kyoto. Wander along the narrow winding alleys leading up to the temple, lined with magnificently preserved old houses, craftmen’s workshops and tea houses. Soak up the flavor of traditional Japanese atmosphere, and perhaps purchase some exquisite locally crafted souvenirs. Later, return to your hotel. A day to explore ancient Kyoto’s grace and beauty on your own or join an optional tour. You may visit some of the smaller and serene temples, marvel at splendid classical Japanese gardens, see the exquisitely dressed geishas at the colorful Gion corner, or join a traditional tea ceremony. Perhaps visit the acclaimed Miho Museum, built on a wooded mountain-top outside Kyoto. Also available is an optional excursion to Nara, Japan’s first capital and symbol of tranquility, where you may see the world’s largest indoor Buddha. Transfer to the airport for your return flight from Osaka. Your amazing trip to Japan ends on arrival in the USA. 29 days or fewer before departure: No refund.